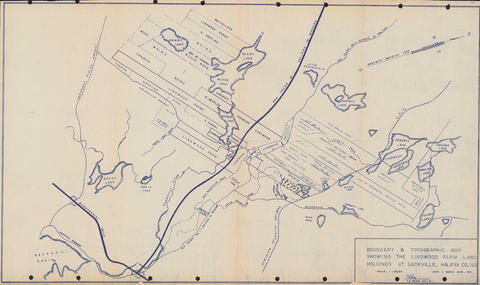 Item MS-4-135, Oversized Folder 11, Item 3 - Boundary & topographic map showing the Lindwood farm land holdings at Sackville, Halifax Co., N.S. Item is a boundary and topographic map of the Lindwood Farm holdings in Sackville, Nova Scotia. The map shows properties owned by MacCulloch; Lindwood Farms; G. Heffler; Moirs; Ellis Bros.; Thomas; R. Heffler; Thomas; Oliver; A. Shankel; Wm. Davis; Kelsie; Wyse; Lively; Carmichael; Kelly; Charles Goffe; Ed. Ford; Mrs. Hilchie; Wambolt; and Hopkins. The drawing was produced by F. G. Nolan.